When a Japanese maple (Acer palmatum) looks as if some of Santa's mischievous elves visited at night to decorate it with tiny, bark-, twig- or leaf-covered ornaments, suspect bagworms. Protected inside the diamond-shaped, silk-lined enclosures, bagworms infest Japanese maples wherever they grow in U.S. Department of Agriculture plant hardiness zones 5 through 8. Their numbers are highest in summer, and a large bagworm colony may strip a Japanese maple's leaves. The trees usually recover, but their striking foliage is sorely missed until they do. 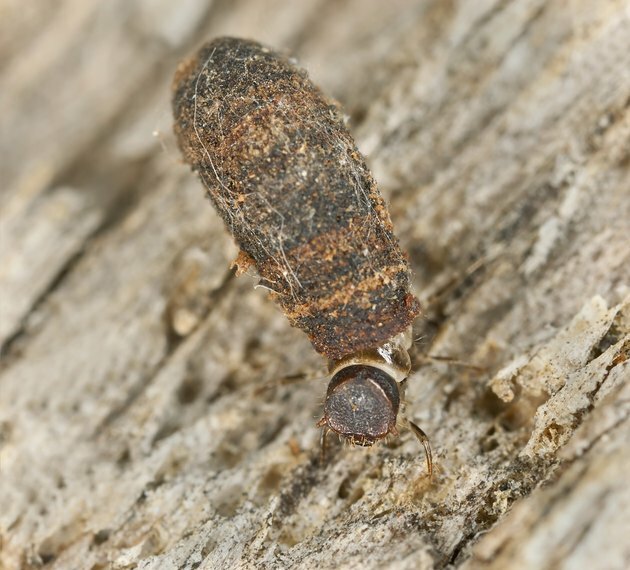 Bagworm bags have openings in their ends so the worms can exit to feed. To eliminate bagworms on small, lightly infested Japanese maples, wait until the trees have dropped their leaves in winter so the bags are more visible against the bare branches. Handpick them and dispose of them in sealed plastic bags. Simply tossing them onto the ground won't work, because many of the bags contain eggs that will hatch in the spring, releasing up to 1,000 new worms that quickly reinfest the trees. To make handpicking less tedious, ignore any bags with dark pupal cases protruding from their free ends. They contain male worms that emerge as adult moths, but can't mate unless there are females nearby. Parasitic Ichneumonidae and Chalcidid wasps both prey on bagworms. They paralyze the worms with their poisonous stingers before laying their eggs inside of them. The wasp larvae then devour the worms from the inside out. To lure these beneficial wasps to a bagworm-infested Japanese maple, plant pollen- or nectar-rich flowers and herbs, such as annual marigolds (Tagetes erecta), rosemary (Rosemarinus officinalis, USDA zones 8 through 10) or lavender (Lavandula spp., USDA zones 5 through 9), nearby. Bacillus thuringiensis var. kurstaki kills young bagworms without harming predatory wasps or other beneficial insects. An organic, bacterial-based insecticide, Bt compromises the worms' digestive systems so they stop eating within two days and eventually starve. Determine when to spray by gathering a few female bags -- those without protruding pupal cases -- in late winter and storing them in a sealed container away from sunlight. When the eggs inside begin to hatch, spray the tree. 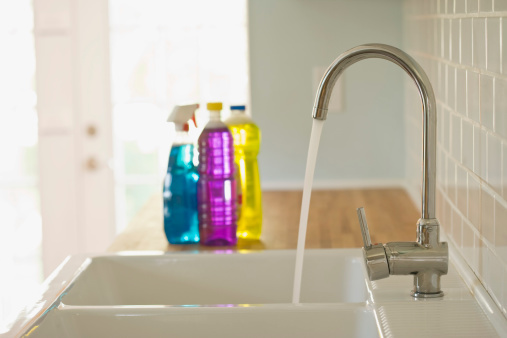 Mix 1 to 2 teaspoons of wettable Bt powder per 1 gallon of soft water in a backpack or hose-end sprayer. To protect the UV-sensitive microbes, treat the tree in the early evening. Spray so both surfaces of all the leaves are thoroughly wet, and repeat daily with fresh solution until the worms stop hatching. To avoid eye or skin irritation, wear a long-sleeved shirt, long pants, safety goggles and waterproof gloves while spraying. Depending on variety, mature Japanese maples typically reach between 10 and 25 feet tall. Thoroughly spraying a larger one with Bt may call for a hydraulic or air-blast sprayer, available from garden equipment rental stores. A hydraulic sprayer uses the pressure from a large volume of water to reach its target. It operates with a hand-held gun. The air-blast sprayer uses a high-velocity air stream funneled through a cone nozzle. Use these sprayers only when there's no wind and the humidity is relatively high, so the spray hits the tree and stays wet long enough to be effective. Air-blast sprayers require a temperature above 45 degrees Fahrenheit. Mix the Bt in the same proportion as you would for a handheld sprayer, and follow the sprayer manufacturer's instructions regarding nozzle pressure settings.